A bad workman always blames his tools. A good workman selects the right ones! To effectively leverage video alongside text, email, phone and social media, you need to be able to produce video to a business-professional standard in five minutes or less. DSLR cameras take too long. Cell phones get fiddly. Whereas, a webcam kit combined with five building blocks and a little practice makes perfect. If you're responsible for generating sales and there's a relationship-based component to your sales process, incorporating video into your communication toolkit can and will enable you to build trust in record time. In the more recent versions of Camtasia, you can edit video recorded with the Logitech Webcam Software. However, Camtasia falls short for editing talking head video. I use Sony Vegas Movie Studio to edit my blog post videos, combined with the iZotope RX plugin to clean-up the audio. Here’s a screenshot of the outline I used to ad lib the message, with the logo reveal points marked. 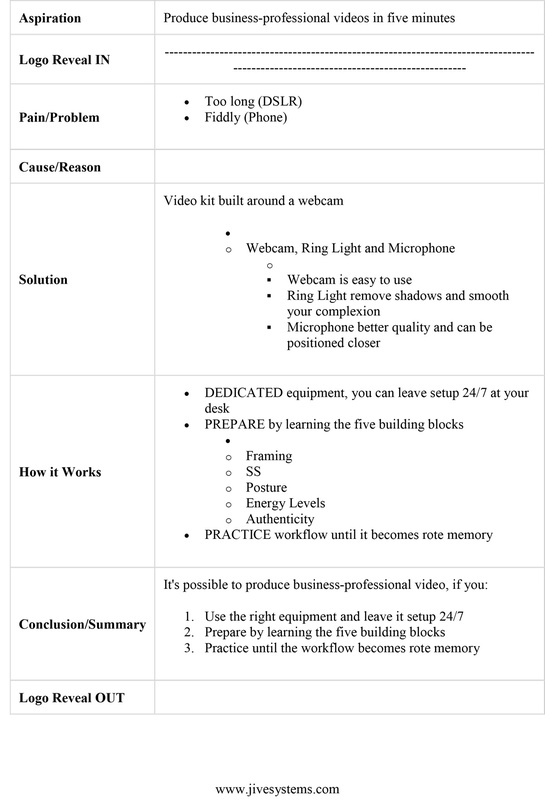 What do you think about using screencast and Snagit for video emails. It does allow for a bit of editing. I mean are there any real drawbacks vs. the ease of clicking a button and recording? Snagit and Camtasia can both record videos. Screncast.com is a hosting service, but they videos play in flash. iPad, iPhone and Android devices do not support flash. Edit-free is the way to go if you want to use video alongside text, email, phone and social media. Edit Free is a software? Rephrase: Video follow-ups are best done off-the-cuff, with no editing. Hi Will, Thanks for the great videos. I had been advised to buy the Blue Snowball, which seems to have a really low volume of sound, so after watching your video, I thought I’d rather buy the Blue Nessie but so many comments on Amazon seem to say that the Blue Nessie bugs all the time and is really not reliable or robust. So I am confused. Is the Blue Nessie much better than the Blue Snowball? Thanks in advance for your reply. Hi Aurelia. The Blue Nessie is a good microphone. Sure, it has its bugs, but what doesn’t nowadays? I recommend buying directly from Blue, BHPhoto or DVeStore as opposed to on Amazon. If you have more room in your budget the Rode NT USB is an excellent microphone. People have reported fake products on Amazon. When purchasing direct, you know the device will be legitimate and the manufacturer makes more money. Second to that, buying from an authorized dealer is best. There is only one Blue Nessie. The price variance on Amazon is due to the vendors/suppliers. Blue SHowball is a good microphone for the money if you stick it on some books or a stand to get it closer to your mouth. Blue Nessie has the stand built-in, the downside it has a larger footprint (it’s not portable). Samson Meteor is also a great portable and economical microphone. Is the base on the microphone flashing If so, the microphone is muted. Tap the little red button on the front to unmute. Also, the microphone sets itself as a speaker. Go to Control Panel > Sounds. Disable the Nessie as a speaker. Thanks Will. I have been able to solve the problem on Skype by going to Skype settings. Unfortunately, the software already integrated in my computer to take videos (called “Camera”) has no sound settings. So I’m trying to find another free software to take videos. Thanks for your terrific information. A question on the Logitech C920 which I purchased and love. When i send a video email to some IPAD and IPhones it can’t be played because it says it wont support the WMV format? Is there a work around for that error so it plays on mobile devices. Thanks again. Thanks for the thanks 🙂 The Logitech is a handy and trusty little device! It’s still better than the newer models I’ve tested (based on compatibility). For example, I’ve been testing the Brio (the lastest webcam from Logitech) and am yet to get it to work. Regarding your playback situation… this is where a hosting service like jiveSYSTEMS comes in. Our platform encodes each video into multiple file formats and bitrates, ensuring your video will playback across all devices. You also get premium features like viewer notifications and heatmaps. You could use YouTube too (if you’re looking for a free option). Hi Will, Thanks for the intel…When you say YouTube are you meaning send the Logitech email to Youtube if I need to send it to mobile devices or Bypass the Logitech completely and just use YouTube?? Thanks again. Record in the Logitech webcam, then upload the video to YouTube. You can then share the video directly from YouTube, or copy the link into an email. The other route would be using jiveSYSTEMS. You would record in the Logitech webcam, then upload to jiveSYSTEMS. You can then instantly email the video.